New Chinawhite album arriving soon! New Praying Mantis album coming! Chinawhite has put some fan favorites to videos. Check the film section for a bite! The band also has a holiday sale going on: buy 2 and get 3! Any combination possible and no shipping charge! To take advantage of this opportunity please visit this link. please check out some video‘s with Malina Moye at Bospop! 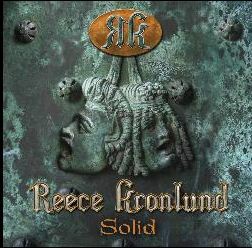 read some thoughts on the Reece Kronlund album solid here. A new milestone is about to be added to the list of milestones: Bospop in Weert, Netherlands. Coming sunday I’ll supply the backbone and heart beat for Afro American female singer and guitarist Malina Moye. Music always wins (humbly quoted from Mr. V. Collaiuta). After a good few years out of the music business it is great to see one time Accept singer David Reece back in very regular action. Teaming up with Dogface guitarist Martin Kronlund in the band Gypsy Rose, the pair released Another World in 2008, before Reece put out a solo album one year later. Next up came the comeback album Cadence from Bangalore Choir kept the ball rolling at full pelt last year. Kronlund was also involved with Cadence as well as the recent Bangalore Choir reissue On Target and therefore it is no surprise to see the pair back together so soon for the first Reece/Kronlund album, simply titled Solid. Now that album title may give the impression of a dependable and steady release, however that description would be selling this album short and by quite some distance. Cadence, which was a mighty fine album, was seen by some (not me!) as a little too modern to carry the Bangalore Choir name and for those people Solid should fit the bill perfectly. Built round big brash guitars, huge melodies, gargantuan hooks and the mighty Reece-Roar, this album nods a little more firmly in the eighties arena rock direction, although this is no nostalgia trip as in terms of sound and execution the album is bang up to date. Racing out of the blocks with the punchy “My Angel Wears White”, Solid wastes no time with introductions, instead we get a huge chorus that greets you like an old friend before being backed up by some gritty and in your face guitars. The heavy bluesy stomp of “Samurai” allows Kronlund to really crank things up and with the backing of Bangalore Choir stick-smith Hans in ‘t Zandt, kicks out a thick groove that hits home with a hefty thwack!Reece himself is in stunning form, with his throaty, yet crystal clear vocal power being as captivating as ever and whether it is the more restrained “Could This Be Madness”, or the meatier delivery of “Paint The Mirror Black”, there’s no question that he is one of the best at this game. There isn’t a duff track anywhere in sight on Solid, with the darting riff of “Animals And Cannibals” adding an almost power metal chorus to a bouncing rocker of a song, while the confident swagger of the oddly titled “Magic Pudding” brings another different angle to the Reece/Kronlund sound, with a vibe similar to the Allanah Myles hit “Black Velvet”, even if this song is considerably heavier. More impressive than the title Solid would suggest, the only question I have after listening to this album is which of the many excellent bands and projects that Reece currently has on the go, will we hear from next. Whichever it is I hope David manages to keep up his prestigious album a year work rate, as with output as spellbinding as this, there’s no danger of getting too much of a good thing! 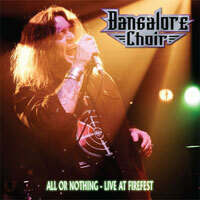 first the news that the Live At Firefest CD from Bangalore Choir is out now. It is in limited quantities available at www.thefirefest.com. 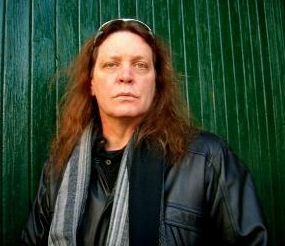 REECE-KRONLUND is the new project of singer David Reece (ex Accept, Bangalore Choir) and Swedish guitarist/producer Martin Kronlund (Gypsy Rose, Dogface). Their first album “Solid” offers a fine mix of Hard Rock and Melodic Metal and includes a high toned companionship of musician guests playing musically and also co-writing songs on the album, i.e. on ‘My Angel Wears White’ (Tommy Denander), ‘Edge of Heaven’ (Andy Susemihl), ‘Samurai’ (Rikard Quist) ‘Could This Be Madness’ (Brynn Arens) and ‘Animals and Cannibals’ (Christian Tolle). The drums are played by Hans in ‘t Zandt. Tracklist: 1. My Angel Wears White, 2. Samurai, 3. Could This Be Madness, 4. Animals And Cannibals, 5. Remember You, 6. Paint The Mirror Black, 7. I Would, 8. Edge Of Heaven, 9. Magic Puddin’, 10. The Dead Shall Walk The Earth. hopefully Arabia’s all new Welcome To The Freakshow available for the first time anywhere. Our special 5 cd’s for £40 and the recession beating 10 cds for £70 offers will be available on the day also. The revised Schedule is now ………………. 5:40pm – 6:40pm MAD MAX featuring Michael Voss [Casanova] this will be Mad Max’s first UK appearance in what we think is 25 years! 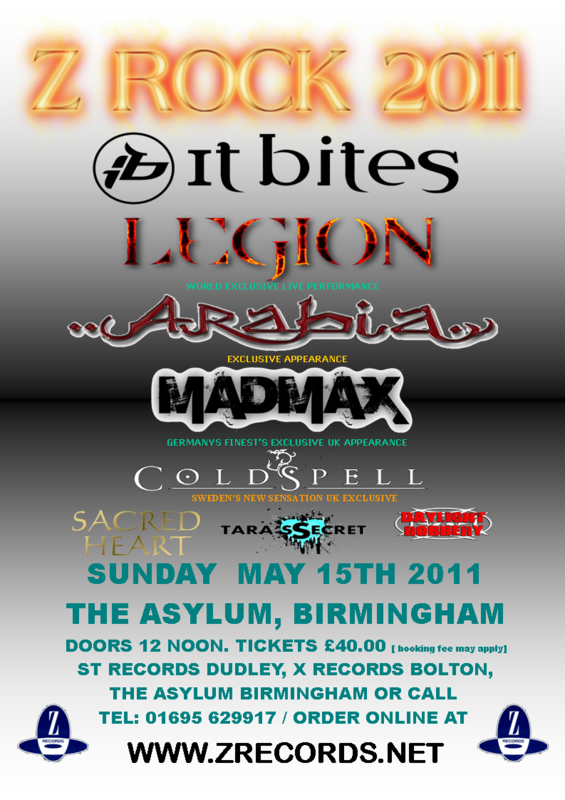 7:05pm – 8:05pm ARABIAit’s nearly 10 years to the day since Arabia’s last UK appearance, a new album is out June 4th but we hope to have copies available at this years show! 8:20pm – 9:20pm LEGION the bands debut live performance, with a critically acclaimed debut and the all new Code of Honour being released on April 4th all eyes will be on Legion. I’m very pleased to announce that I’m asked to play at Bospop Juli 10th with an American singer whose name I’m not permitted to disclose, yet. The Festival will soon go public with the new names. Feel free to check in later for more details, a’ight? So sad to let you know that my former band mate with Vengeance Jan Somers past away yesterday, Friday 28th January. We worked together for quite a while. We created and toured three albums with Vengeance: Back in Ring, Same, Same … but different and Soul Collector. Being a great musician and multi talented anyways Jan can definitely say: I did it my way!